Sweet and savory side dish made simple. In a large skillet, sauté apples, carrots, onion, butter, ¼ cup sugar, cinnamon and lemon zest until softened, about 5 minutes. Reserve. Meanwhile, roll out pie crust and place in a 9-inch pie plate, prick with a fork and crimp the edges. Bake for 8 minutes or until golden brown. Reduce heat to 350°. Pour contents of skillet into prebaked pie crust and dust with remaining sugar. 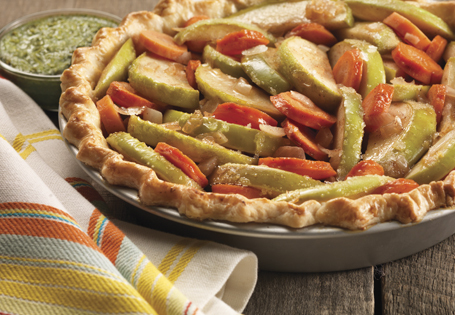 Return to oven for 15-20 minutes, or until carrots begin to soften and apples brown. Meanwhile, in a small saucepan, add chicken broth and peas. Bring to boil, then simmer for 3 minutes. Remove from heat. Using a blender, puree pea mixture and mint leaves until desired consistency. Season to taste with salt and pepper. Return to saucepan to keep warm. To plate, spread 2 tablespoons of puree on a plate with a warm slice of tart.